This article makes a case for using regular solid bars of soap and detergent powders instead of liquid soaps. 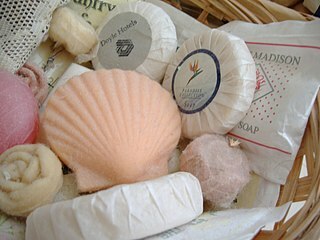 Soap bars are available all over the world at cheap prices. They are great for use at home and for travel. Use a regular bar of (solid) soap while taking a shower every day instead of expensive liquid soaps. Using a regular bar of soap is cheaper, simpler and more environmentally-friendly than liquid body washes. A bar of soap is also easier to travel with: It avoids potential leakage of the liquid messing up your travel bag. Unlike liquids, it does not cause airport security hassles. All you need to do is dry it and carry it. If you lose or run out of your soap while traveling, no problem, just buy another. Its simple, minimal paper packaging is better for the environment than plastic bottles that liquids require. While taking a shower, you don’t have to waste time opening the bottle, pouring the liquid, closing the bottle and keeping the bottle clean. With a soap bar, you just pick it up from the soapstand, use it and put it back. Soaps bars are simple, convenient and stress-free. Wash your hands regularly with a regular bar of soap placed near the sink. There is no need to keep a liquid or gel there either. The liquid soap does make good sense in places like public restrooms where it is shared with strangers. Washing your hands after returning from the gym, after travel in public transportation and before cooking and eating is always a good idea. It is also a healthier, safer and cheaper alternative to keeping bottles of hand sanitizers at home. By the way, scientific studies have shown than more expensive, so called, anti-bacterial soap bars have no significant advantage over using regularsoap bars.1 It is the habit of washing regularly with soap that matters for good health, not whether your soap is anti-bacterial or not. I also recommend using a bar of shaving soap instead of shaving cremes and foams. It has earth-friendly benefits, travel convenience and cost savings similar to the ones I mentioned above for body washing soap bars. A bar of shaving soap lasts much longer than foams and shaving cremes that cost a lot more. It comes in minimal packaging, typically paper/cardboard and you don’t have to dispose off aerosol cans, tubes, etc. Soaps are available at very low cost, especially in bulk at online retailers like soap.com and at brick and mortar stores. They take up little space, are light and don’t go bad even in a couple of years, especially when stored in their dry, sealed packaging. Also, inexpensive soap powders can save a lot of money over expensive liquid laundry detergents. For example, this Charlie’s Soap Powder – 2.64 lb Bag does 80 large loads of laundry, has excellent reviews on Amazon and costs $11 (with free 2-day shipping with Amazon Prime)2 . For hand-dishwashing, I do prefer liquid gels. They are quite inexpensive and easy to use. That’s because they mix with the water quicker and lower the odds of the soap getting left on the dishes. I recommend Palmolive Ultra Pure and Clear Dish Liquid, which is also good3 for hand-washing merino wool clothes. There are many tips available on the Web about using products that can help you be healthier, happier and environmentally-friendly while also saving you money. Reading tips on lifehacker.com inspired me to write this.